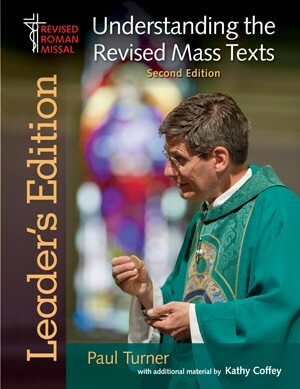 Understanding the Revised Mass Texts Leader’s Edition, Second Edition Paul Turner with additional material by Kathy Coffey New words . . . deeper meaning, same Mass. You may have heard that there will be some changes to what we hear and say at Mass. Mass will remain the same, but some of the words will be different. Prepare for these changes with Understanding the Revised Mass Texts Leader's Edition. Because changes have been made to the Order of Mass since its recognitio in 2008, a second edition of Understanding the Revised Mass Texts Leader's Edition is now available. The second edition of this Leader's Edition is the companion to the booklet, Understanding the Revised Mass Texts, written by Paul Turner with additional material by Kathy Coffey. The booklet is reprinted in this Leader's Edition with page specific catechetical notes for adult faith formation session leaders. Inside you will find: A pastoral introduction; Outlines for eight adult faith-formation sessions; An image of the corresponding page from the Understanding the Revised Mass Texts booklet with marginal notes explaining each page; Annotations for matching up the leader’s edition with the pamphlets; Arrows and highlighted texts emphasizing important concepts; Charts comparing the current and forthcoming translations; Engaging questions for discussion during sessions; Take home reflections; A notes section for you to write down thoughts and idea. It will assist you in: Training parish staff to answer questions about how and why the revisions were made; Preparing presentations and homilies explaining how the translation is rooted in scripture; Creating faith formation sessions that prepare parishioners for the responses they will soon say. The following changes have been made to the Order of Mass since its recognitio in 2008. These changes will be reflected in the second edition of Understanding the Revised Mass Texts Leader's Edition. The words of absolution in the Penitential Act have been modified (so that the text of the current edition of The Sacramentary is maintained); The addition of "I believe" at three points in the Profession of Faith; Several slight modifications to the texts of the Eucharistic Prayers; The final doxology of the Eucharistic Prayer has been slightly altered. Planning faith formation sessions on the revised Roman Missal? Additional resources are available for FREE download on www.RevisedRomanMissal.org.